Coach Stew Morrill and crew got a good look at several recruits last weekend in a huge high school basketball tournament held on the campus of Utah State University. They even looked down the road a few years at a possible future Aggie named Jared Stutzman from Idaho Falls, Idaho. There were reports in July of last year that Utah State was showing interest even before Jared entered high school. Another report indicated that Jared has made visits to Utah State, BYU, and Boise state. Jared is in the class of 2014 and is considered by some to be at the top of his class in the state of Idaho. He has family ties to both Utah State and BYU, and reportedly wants to play Division 1 ball in the state of Utah. 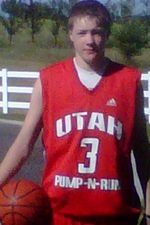 Jared started as a Freshman this past year for Bonneville High School and playing mainly as a wing. It will be interesting to see the recruiting heat up over the next year or two. Jared plans to serve an LDS mission, so may actually not play at the next level until the 2016-17 season. Will Jared follow in the footsteps of fellow Idaho standouts Spencer Nelson (Pocatello) and Brady Jardine (Twin Falls) and suit up in Aggie Blue and Fighting White?